Commoner & Co restaurant opened in June 2015. After 2 years of serving up unique American food, it clearly is a winner on Tucson’s Northeast side. 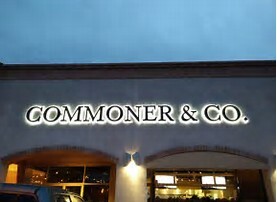 Located at 6960 E. Sunrise Drive (on the southeast corner of Sunrise and Kolb) Commoner & Co is receiving very positive reviews. The dinner food choices are varied and interesting. Oh, the happy hour is great. And on Sunday there is brunch. The atmosphere at Commoner & Co is anything but common. But it is not the place for an intimate evening out with your spouse or significant other. The inside space presents high ceilings, industrial duct work and large overhead doors that open to the outside patio. The outside area provides stellar views of the Catalina Mountains. It reminds you of the service area of a large auto dealership. And if the word “noise” comes to mind, you are right. It is! The menu at Commoner & Co is small but varied. Just one page. But everything is made from scratch. Great appetizers! A short rib empanadas with apricot dipping sauce is an interesting starter. It is fabulous! Looking for something a little different? Try the brulee goat cheese tart. Great flavors that are perfect for a favorite wine or other beverage of choice. One of the house specialties is the C&C Burger. This beauty challenges the taste buds. It’s flavored with brown sugar, pepper cured pork belly, horse radish pickles and a house dijon. OMG! If you can finish the C&C Burger off, you must be hungry. Other top menu picks include the braised short ribs and seared ribeye. Don’t want meat, try the crispy white chicken served with cheddary grits. If there is a downside at Commoner & Co, it’s the service. The word spotty comes to mind. It can be good to great, but also poor. Hopefully, that will get better. Commoner & Co strives to be a top neighborhood gathering place on the Northeast side. The food and bar are reaching the mark. With better service, this new Tucson restaurant will be at the top of the list. We use multiple online marketing channels to showcase your home. We will build a stand-alone website built to show your home. Our marketing program targets key cities in the U. S. based on the season. For luxury listings, our drone service provides video of your home and neighborhood. This video along with professional photos helps the online buyer see and feel in your home.based on the season. For luxury listings, our drone service provides video of your home and neighborhood. This video along with professional photos helps the online buyer see and feel in your home.